Ticks can transmit multiple pathogens. Over 10% of ticks contain Borrelia bacteria and can potentially transmit Lyme disease. 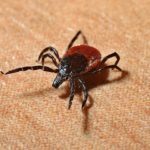 The risk of contracting Borreliosis (Lyme disease) after a tick bite is 4%. So on average, one hundred tick bites cause four infections. About 0.5-2% of the ticks contain further viruses that can cause dangerous diseases like ehrlichiosis, rickettsia, babesia… in all there are at least 16 known diseases that can be transmitted by ticks. Prevention of tick bite is better than treatment, but what repels ticks and can reduce the risk of tick-transmitted illness. 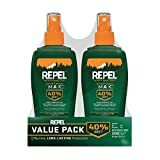 Repel Sportsmen Max Insect Repellent a highly effective insect repellent that contains the active ingredient DEET. DEET is widely considered as one of the most reliable and effective insect repellents. It strong deterring effect works on a large spectrum against various insects. These include, in particular, mosquitoes, ticks, and fleas. However, strong DEET may cause allergies or skin irritation in some users. The substance gets absorbed through the skin, it is broken down in the liver and excreted. A mosquito repellent with DEET should not be used by pregnant women or small children. When using an insect repellent with the active ingredient DEET you should always consider which risk is higher: get a dangerous disease through a mosquito or tick bite, or the side effects of the drug. Key features: repels and deters insects. Pros: highly effective against all kind of biting and stinging bugs. Repel Lemon Eucalyptus Natural Insect Repellent a repellent that is purely made out of natural and organic substances. 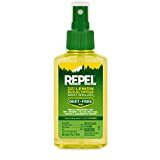 Repel insect repellent is made up of lemon and eucalyptus oil. It has a cool and refreshing scent that repels dangerous mosquitoes that cause severe diseases such as Dengue, Zika, West Nile, Chikungunya and more. Apply to directly to clothing and exposed skin. Do not spray directly on the face, instead, spray on the palm of a hand apply to face and neck. Key features: natural ingredients, lemon and eucalyptus oil. Pros: repels ticks, mosquitoes, cool refreshing scent. 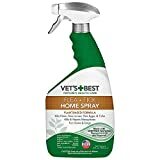 One of the top-selling tick repellents is Vet’s Best home spray. This home spray has many useful advantages and it repels all the unwanted pests from the house. This spray kills the flea larva, flea eggs, fleas, and ticks completely. This spray can also be used as a mosquito repellent. 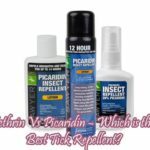 It is made up of natural ingredients such as peppermint oil and clove extracts and with the help of these natural ingredients, it eradicates the ticks completely. This spray is specially designed for dogs and cats. The non-staining formula of this product allows you to directly spray it onto carpets, rugs, bedding, upholstery. Plants are not harmed by this product and it has a unique design. Do Not use on humans, don’t use on pregnant or nursing pets. Key features: peppermint oil, clove extracts. Pros: non-staining technology, suitable for all, kills pests. This bestselling insect repellent is specially designed to treat clothing, tents or any other outdoor gear. 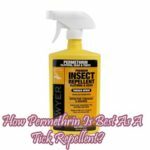 Permethrin clothing spray will keep you safe from the harmful pest by killing them when they get in contact with treated fabrics. It is effective against ticks, fleas, bugs, and any other insect. When sprayed on clothing the effect of the spray will last up to 6 weeks. 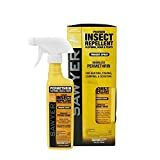 Permethrin spray has anti-staining properties and is odorless. Effective protection for anyone who spends time in the outdoors hunting, fishing or backpacking. Key features: innovative design, lasts up to 6 weeks and odorless. Pros: provides safe and reliable protection against all sorts of biting pests. YAYA Organics is a company that specializes in natural and organic products that are safe for the body as well as the environment. 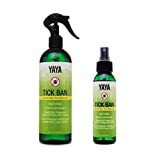 YAYA tick repellent is an all organic tick repellent that is made using natural and essential oils. This repellent is safe to use by all the members of the family and even it can be used for pets. The YAYA tick repellent can be used by anyone who enjoys the outdoors and nature activities such as fishing, hiking, golfing, hunting, etc. YAYA repellent has a fresh herbal scent, that repels ticks, mosquitos, and other biting insects. Key features: natural ingredients, essential oil. Pros: suitable for all, safe and used for many purposes. 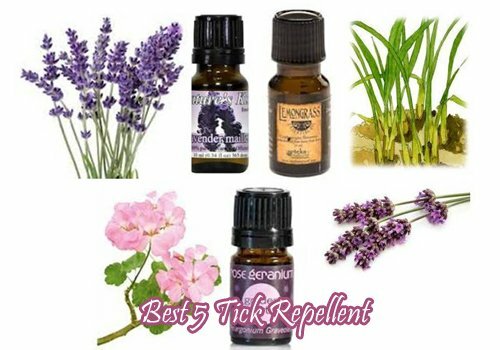 These are some of the most popular and effective tick repellents in the market. And what repels ticks also repels mosquitos and other bloodsucking pests. So choose the best tick repellent and enjoy a safe time outdoors. If you still get bitten by a tick observe the bite site and your body for signs and symptoms. During outdoor excursions in meadows, forests, and fields or even in your yards around your house, ticks can be found in increasing numbers. So even on warm days, instead of shorts and Flip-flops, you may want to wear long pants and sturdy shoes, to make it more difficult for ticks to attach. Wear bright clothes as on those crawling ticks can be easier seen than on darker clothing. And most important protect yourself with effective tick repellents.